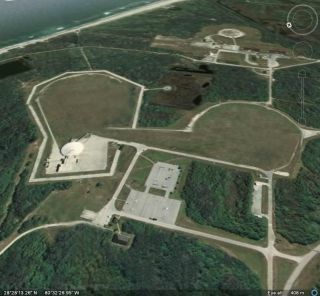 Aerial view of Space Launch Complex 36 at Florida's Cape Canaveral Air Force Station. Moon Express will be using the historic site for spacecraft development and flight tests. A historic launch complex that helped send NASA probes off to explore the solar system is being pressed into service again — this time, by a moon-mining company. California-based Moon Express, which seeks to extract and exploit lunar resources, will base its spacecraft development and flight-test operations at Space Launch Complex 36 (SLC-36), a facility at Florida's Cape Canaveral Air Force Station that was used for 145 Atlas V rocket launches from 1962 to 2005, company representatives announced Thursday (Jan. 22). Some of those SLC-36 liftoffs in the 1960s sent NASA's Surveyor probes to the moon, to demonstrate soft-landing capabilities required for the space agency's manned Apollo missions. "We are honored to have an opportunity to establish permanent operations at Cape Canaveral SLC‐36, at the place where the U.S. first went to the moon," Moon Express co‐founder and CEO Bob Richards said in a statement. Moon Express will be using the historic Space Launch Complex 36, at Florida's Cape Canaveral Air Force Station, for spacecraft development and flight tests. Moon Express signed the SLC-36 agreement with Space Florida, the state's aerospace economic development agency. The launch facility was decommissioned in 2007, but in 2010, the Air Force issued licences to Space Florida, with the aim of making SLC-36 available for commercial use, Moon Express representatives said. Moon Express will make an initial investment of up to $500,000 in SLC-36, which should allow development and flight-test work to begin there early this year, company representatives said. These operations had been based at the Shuttle Landing Facility at NASA's Kennedy Space Center, Cape Canaveral's next-door neighbor. Moon Express plans to fly government and commercial payloads to the moon, and eventually aims to mine lunar resources such as water ice, metals and helium-3, a fuel for potential nuclear fusion reactors. The company is developing a coffee-table-size lunar lander called MX-1 whose first trip to the moon is scheduled to occur soon, as part of the $30 million Google Lunar X Prize competition. The first privately funded team to land a robot on the lunar surface, have it travel at least 1,650 feet (500 meters), and send data and images back to Earth by the end of 2016 wins the $20 million grand prize; another $10 million is set aside for second place and a variety of special accomplishments. Follow Mike Wall on Twitter @michaeldwall and Google+. Follow us @Spacedotcom, Facebook or Google+. Originally published on Space.com.